Councillors clashed in a fiery exchange over the funding of a group to discuss highways issues facing Arun district last week. The Joint Western Arun Area Committee (JWAAC) meets quarterly in public – but town, parish, district and county councillors also attend a private sub-group to discuss highways and traffic matters. But last Tuesday’s meeting (February 27) saw questions raised over why six parish councils had refused to contribute towards the sub-group’s running costs, around £190 each annually, while three had not responded. Aldingbourne chairman Martin Beaton and Eastergate chairman Chris Allington were both accused of ‘griping’ by Aldwick’s Lilian Richardson after both had questioned whether the sub-group was a ‘talking shop. 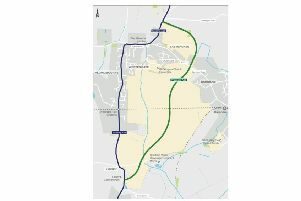 The duo had called for the area committee to focus on more strategic issues, including the infrastructure issues associated with the threat of thousands of homes new homes in Barnham, Eastergate and Westergate. Highways officer Ben Whiffin said parishes would still retain contact with officers if they did not join in with the sub-group – which has no decision-making powers. He noted meetings, which provide a forum to raise issues, often lasted two hours and discussing matters at JWAAC would extend meeting times. Speaking after the meeting, Mr Beaton said he had no issue with the sub-group but called for JWAAC to better address strategic issues residents wanted answer on.